After 8 August 1918, with some excellent leadership, the Diggers headed eastward, on both sides of the river. 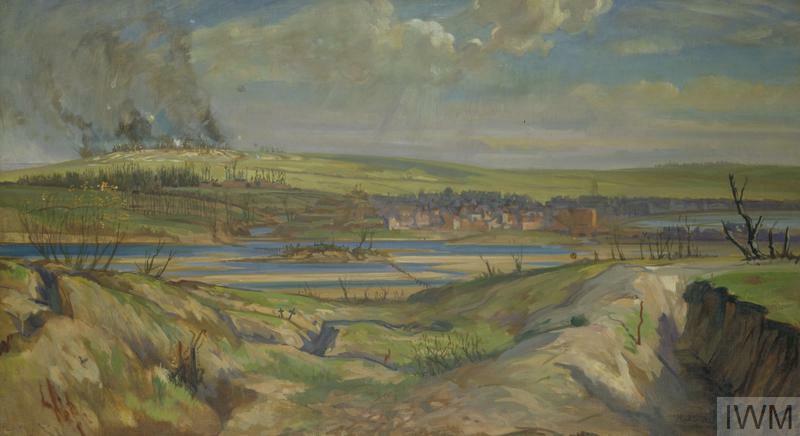 The Allied victory at Amiens proved to be the starter’s gun for an extraordinary Australian offensive up the Somme valley – roughly 35 km to the Péronne area where, around the river’s bend, enemy defences exploited the complex terrain. Once through all that, the Australians kept pressing on over a similar stretch, to their final attack. In these eight weeks, up to early October – with skilful fighting and a speed that allowed the enemy no recovery time – the Australians carved a great corridor of victories through the German defences. Simultaneously, right along the western front, the Allies combined to force the enemy ever backwards. To the north, the replenished British armies hammered the thunderstruck Ludendorff. That he would suffer beatings at British hands was a thing he couldn’t comprehend. Yet the BEF’s “Hundred Days” (up to November) of continuously defeating the Kaiserreich’s army was, as historians have shown, the British Army’s most sustained success in modern times. In the late summer of 1918, the BEF made short work of Ludendorff’s intended “Winter Line”, the Canadians smashed the powerful “Drocourt-Quéant” defences, and the Germans were driven further back into a sector of the Hindenburg Line. South of the Somme the French were also hammering forward and doing the same in Champagne, where Foch’s attacking general, Mangin, was relentless. South of Verdun, 550,000 Americans, 110,000 poilus and 267 French tanks were all too much for the defenders of the St-Mihiel salient, who cleared out for the loss of 450 guns. Pershing’s army then took on a much tougher prospect in the steep and wooded terrain of the Meuse-Argonne (north of Verdun). Here he had to slug it out with a harder set of defenders, who fought bitterly for every metre of the region, with well-placed machine-guns. In the Australian zone, by late August, the Diggers had reached the great bend in the river at Péronne, where the north-flowing Somme swings westward. Here were marshes, streams and higher-ground defences, above all at Mont St Quentin, overlooking Péronne. By taking “the Mont” and Péronne itself, the Australians could force Fritz out of this awkward zone and right back to the Hindenburg Line. This they did, and with minimal forces. With rapid bridge-building and brilliant manoeuvres, the Diggers surprised a renowned Guards division at the Mont. In furious fights, parts of the summit were taken, defended, lost, and then finally secured by the 6th Brigade’s second assault. Though “tired” and numerically small, the Australians had nonetheless “captured one of the most formidable positions on the Western Front and taken over 500 prisoners”. And by 3 September, the whole Péronne area had been taken. Elliott’s 15th Brigade, like others, had played its part to the full. At one stage, the impatient Pompey tried to cross the Somme canal via a broken bridge. He slipped, fell in, and for a large man he did well to get out onto the bank. While his embattled trousers were drying, the unabashed brigadier stalked around in his shirt-tails giving out fresh orders. His signallers gleefully spread the news: “Pompey’s fallen in the Somme.” Among official signals, Haig sent congratulations for the capture of Mont St Quentin and Péronne. And from Fourth Army, Rawlinson, who believed Monash lacked sufficient resources but had still allowed him to try, expressed his delight at this magnificent feat – which drove Fritz out of the position he’d expected to maintain, and into another demoralising retreat. One great task remained for the Australians who, like Monash himself, were now close to exhaustion; to break through the Hindenburg Line. Beyond its sheer difficulty, it was a gamble. Would the Diggers’ physical and mental reserves be enough to overcome the gruelling ordeal and the heavy losses this task would take? AIF battalions were now a shadow of their earlier strength, for the Diggers had been paying a heavy price for their swift advance: over 35,000 casualties in the final three months, with reinforcement seriously inadequate. Battalions were down to a quarter of their proper manpower. On paper, a battalion had four companies, each about 210 men; but by mid-September, most AIF battalions had been reduced to glorified companies, except that they did have more firepower, and more men carried Lewis guns. Firepower was welcome, but these remorseless losses were starting to haunt the Australians. For the men still in action, a “casualty” was a well-known comrade until yesterday, or last week; he was a staunch mate who fought with you at Broodseinde, or Bullecourt, or back in the madness of Mouquet Farm; but he was gone, and you just had to fight on without him. And with bodies close to exhaustion, the Diggers’ minds were now troubled by a new kind of demon. It was an idea, a possibility, that had never before confronted them so starkly. And it was deeply unsettling: the way things were looking, by the time these never-ending attacks were over, a man’s own battalion would be completely wiped out. As an Australian volunteer on the western front, your battalion was something special. Families and loved ones were far away; but your own unit was here, full of spirited young men who’d made the same choice as you. You were there among them in March and April’s desperate fights, and you had counted on each other. You belonged in this battalion, you were proud of it. So despite relentless attrition, the terrors of gas and heavy shelling, army food, sleep-deprivation, miserable dark winters, a world without women, and the boredom of trenches between actions … you wouldn’t swap your battalion for anything. You all shared the same conditions, ran the same risks and enjoyed the irreverent humour. This band of men was going to taste the victory, and carry home the battalion banners – and somehow, you would always be part of that. Or so you’d assumed. But now, when you looked around in September, you saw your battalion cruelly whittled down, you received no word of relief, and you began to hear the murmurs: they’re going to keep us at it until there’s none of us left. And that, along with your own fate, meant your battalion would be rubbed out. Extinct – and soon forgotten. In this situation, a form of mutiny – refusing to attack as ordered – was no longer unthinkable. With battalions down by 75 per cent, and unless the constant pressure ceased, it could only be a matter of time before the camel’s back broke. The last straw, as it turned out, came down on a proud battalion which had fought ever since the Landing. Of its 973 Gallipoli soldiers few remained, and by mid-1918 the 1st Battalion had lost its entire strength three times (over 3000 casualties). Now, three quarters of its fourth life cycle was gone. At the Hindenburg Outpost Line in mid-September, having attacked for five days, this rump battalion was about to head off for its scheduled rest – until these Diggers heard they would have to do another attack, at dawn. On British turf. Once again Diggers would be doing III Corps’ job, and bailing out that teflon dud, General Butler. To an exhausted battalion remnant, this order to cover for an adjacent corps that couldn’t keep up – and the order’s timing – were too much. Given their condition, as one corporal told a court martial, he was “dumbfounded” by the idea; and, he added, when he and other NCOs tried to report the men’s disturbing reactions, the officer leading his company dismissed their approach with the comment “I can’t tell the colonel this.” Instead, he told the NCOs to go and get their men ready for the extra dawn attack. The reaction of over half the battalion, 119 men, was to execrate this order and refuse to do the attack. One author considered it “telling” that 50 per cent of these mutineers had only joined the battalion after May 1917 (Second Bullecourt). He added, “The majority [of the battalion] were short on experience and not sufficiently imbued with … esprit de corps.” Yet twelve of the 119 men enlisted in 1914-15; the other 107 must have included Pozières/Mouquet Farm/Flers/Bullecourt survivors; even among the other 60, some were probably at Broodseinde, and the repulse of Ludendorff offensive. Because the battalion, from mid-1917 to Monash’s fighting advance, earned nine more battle honours. Short on experience? Surely it was too much experience, battle experience. This, together with the cumulative effect of all the losses, and sheer exhaustion, had overloaded these men. As one wrote at the time, “all the boys are fed up … they won’t give us any rest”. Yet it was only an ill-timed, unfair and (as they saw it) shabby arrangement that pushed them over the edge. In all the non-stop fighting, other battalions were also pushed close to their physical and mental limit. It happened to be the 1st Battalion which got that last straw. Their action was mutiny – a capital charge even in the AIF. Maybe that’s why these men were charged with desertion. But desertion, with its whiff of cowardice, was still a very severe penalty. These volunteers naïvely assumed a civilian right to strike over unfair treatment, but they didn’t run away; and given the intensity of the fighting, real deserters would have scarpered long ago. And as long as fit men in Australia could refuse all combat with impunity, was it just to criminalise men who’d been putting their lives on the line? If such mitigating factors were taken seriously, this is poorly reflected in the outcome. The NCOs, who drew attention to the men’s grievances, got the roughest justice: five to ten years jail, while the men got three. After the armistice, they were all pardoned, but as “pardoned deserters” they went home in disgrace. It was a miserable conclusion to arduous, brave, volunteer service, which effectively junked their previous fighting record. Their ostracism continued, bitterly, in their postwar lives. These men had fought Fritz to the point of exhaustion, and at a fateful moment, they refused to be pushed any further. This unease was also expressed within a very different “mutiny”, whose Diggers gained widespread sympathy in other units. To raise and equalise the strength of battalions, eight brigades were told to disband one of their battalions to enlarge the others. This directly challenged that key AIF loyalty in which a Digger’s battalion was almost his clan. The earlier dissolving of three battalions had been very unpopular. Now, to have another eight broken up was too much. Only the 60th Battalion obeyed, after a strong appeal by Elliott, its brigadier. The other seven battalions, after their officers had left a final parade, simply carried on with normal duties, with their NCO’s and other elected leaders keeping up excellent discipline. Food supplies kept mysteriously reaching them from other units, and they declared themselves willing to fight in the hardest parts of the next battle, as long as they kept their identity. Monash agreed – he had disliked the disbandment order himself – and a confrontation was avoided. But as those who were earmarked pointed out, the army had always told them that the esprit de corps and honour of their battalion were paramount. After the final battles of the Hindenburg Line’s locality, the measures took place quietly. By then the 37th Battalion, which had strongly opposed its disbandment, was down to 90 men – 10 per cent of its proper strength. The affair wasn’t called a mutiny; it was anything but desertion; and there were no more repercussions. All the while, the Australian advance kept going. Once the Diggers got close to the Hindenburg Line, they could see some of its multiple trenches and endless belts of barbed wire. Along with older works and related lines, the main defence was over 5 km wide, with integrated canals, obstacles and a vast network of tunnels and passages. What an attacking infantryman could see, he knew, would be only part of this evil labyrinth. Among the veterans who eventually saw it were Maxwell and Doherty, who had recently come through the victorious action on the slopes of Mont St Quentin. What they observed, on reaching the vicinity of the Hindenburg Line, was enough to dampen even Doc’s jauntiness. No wonder: miles of murderous fire could meet the Diggers in this place; in fact, it was “the most formidable defensive position in the history of warfare”. Even with the shrewdest, most comprehensive plan, assaulting the Hindenburg Line meant a big, ferocious battle for the Australians (as it did for allies well to the north and south). With his manpower limited, Monash gave some supporting US units a lot to accomplish; though courageous to a fault, they took heavy losses and struggled to make headway in conditions of smoke and fog. Across the whole battle area, setbacks and well-placed, toughly-defended positions were expected, and beaten, at a cost. The Diggers were thinly stretched but yet again did more than seemed possible for their resources. In a crucial move, the unsung British 46th North Midlanders Division (with brilliant artillery support) made a brave and famous crossing of the St Quentin Canal, a murderous complexity in the enemy system. On 29 September this achievement gave the Diggers a fighting chance to break right into the Hindenburg Line. In its fiendish maze of trenches and traps they gradually outfought, outflanked and overcame the enemy. By 1 October 1918 the AIF 3rd and 5th Divisions had captured one of the most vital sectors of the great Hindenburg Line. By now, did the German troops not see that all hope was gone? The bulk of them probably did. With their ranks horribly thinned, with morale deteriorating (into serious trouble along the supply lines) the German army had been sliding to its doom since July. Its soldiers sensed this, and the figures show it: in the final four months, there were another 800,000 German casualties. Most revealing are the prisoners: in these months the Allies captured (or simply escorted to the rear, in hundreds) 385,000 German soldiers: over half of all their western front POWs of the previous 47 months. Yet with all that, and the punishment they kept taking on the battlefront, the resilience of the fighting German was extraordinary. The tragic truth was that “the discipline of the Field Army largely held” until early October, when news rapidly spread that Berlin had contacted President Wilson with a “peace note” and asked for a prompt armistice. Once this became known among German fighting divisions, what was the point of dying? Countless men, old comrades, were already slain: as one young Prussian-Silesian woman, Ruth Höfner, cried out, “For what have German mothers sacrificed their sons?” No-one, least of all any Prussian warlord, was going to tell her that. At the front, the soldiers’ loyal tenacity finally started cracking, like a great dam, and the large-scale surrenders multiplied. Nonetheless, in many areas, bitter fighting did continue right up to the point of armistice. What happened next is understated in Maxwell’s memoir (but not in his army record). His company commander was hit and Joe took over. With everyone pinned down, facing the wire and machine-guns, he spotted a close German gunner and crawled forward. “Bonzer”, his young Lewis gunner, got in first by shooting the German. In a flash Joe exploited the confusion: moving fast and leaping up onto thickly-wound reams of wire, this lightweight fighter bounded across them like a kelpie, to land in the machine-gun nest with his revolver. He shot three gunners, subdued four, and called his company up; the next company was also pinned down, so he tore along the trench and silenced that crew as well. There was an ugly struggle with yet more Germans who had feigned surrender, but he found a way to outwit them. For his “personal bravery, excellent judgment and quick decision,” Joe was awarded the VC. He was just as happy for his game and quick-witted Lewis gunner, Bonzer, who had fought furiously, destroyed another gun crew, survived, and received the DCM. Worn and haggard by their long serfdom, the French residents of this little hamlet presented a pitiable sight when we pushed into its main street. The old people wept for joy at our entry … On 6 October we left the front line for ever. Having broken the Hindenburg and Beaurevoir Lines, the surviving Australians were finally sent off to rest. Their swathe of victories now stretched back 65-70 km down the Somme valley, through Mont St Quentin and Péronne to Hamel and Villers-Bretonneux. The Diggers returned to the front early in November, but before they could fire another shot, the war was over. The enemy had just signed a ceasefire agreement – the armistice of 11 November.